Burying certain instruments helps astronomers and astrophysicists detect otherwise difficult-to-spot particles. (Inside Science) -- If you want to admire the glittering stars in the night sky, you may go somewhere far away from city lights on a moonless night. But what if there are other things in the night sky that are so faint that even the stars drown out their signals? These "things" include still undiscovered dark matter particles and tiny and elusive fundamental particles called neutrinos. It is very difficult for scientists to study these particles because they lurk behind relatively intense cosmic rays, which are volleys of waves and particles that rain down from outer space. The effect is similar to how one can't see the stars when the sun is out. Luckily, both neutrinos and the so far theoretical dark matter particles can penetrate matter much better than anything else that we know of. Using this characteristic to their advantage, scientists have dug deep, literally, to build some of the world's most impressive observatories to study these whispers from the cosmos. The final leg of Richard Gaitskell's commute is a 10-minute ride on an elevator down a mineshaft. Suspended from a cable spool larger than a semitruck, the mining cage plunges 4,850 feet -- deeper than a stack of three Empire State Buildings -- into the former Homestake goldmine located in the small South Dakota town of Lead. Once he reaches his destination, the mining cage opens into a cavern the size of a cathedral, basked in the white fluorescent light characteristic of research laboratories. Inside this cavern sits a 72,000-gallon water tank. Inside the tank, a titanium flask is suspended like a bell from a three-legged structure. Finally, inside the suspended flask -- at the very center of this series of Matryoshka dolls -- sits one-third of a ton of liquid xenon, supercooled to below -169 F and carefully monitored by sensitive detectors. The Davis Cavern where the LUX experiment sits. This picture was taken in 2012 as it was being enlarged for the Large Underground Xenon experiment. The cavern was previously home to Raymond Davis Jr.'s Nobel Prize-winning solar neutrino experiment. "What we're looking for is a direct interaction of a dark matter particle with a xenon nucleus, a recoil of the xenon nucleus," said Gaitskell, a physicist from Brown University in Providence, Rhode Island, and the co-founder and co-spokesperson of what’s known as the Large Underground Xenon experiment, or LUX. He has been working on dark matter research for the past 30 years. Over that time, the size of dark matter detectors has ballooned. "When I first started as a graduate student, at the time a 10-gram detector seemed reasonable," Gaitskell said. The current detector used by the LUX experiment is tens of thousands of times more massive. Gaitskell explained that the size of the detectors keeps growing because scientists don’t know how strongly dark matter interacts with regular matter. When the small instruments didn’t detect any dark matter, scientists kept making them bigger, since larger instruments can detect weaker interactions. The titanium flask that holds the 1/3-ton of liquid xenon at the heart of the LUX experiment, suspended inside the 72,000-gallon water tank. Most astronomers and astrophysicists are confident that dark matter particles exist based on observations from secondary effects such as galaxy rotations, but they haven't been able to work out exactly how these particles interact with ordinary matter. Without a direct detection to guide the theory, the predictions for the interacting strength of a dark matter particle once spanned an enormous range equivalent to the difference between the sizes of a U.S. quarter and the moon. "I wouldn't even call it a ballpark," said Gaitskell. "It's many ballparks." The current 1/3-ton detector at LUX is about 30,000 times more sensitive than the 10-gram detector Gaitskell used as a student. If we use the same moon analogy from earlier, then if the 10-gram detector was designed to "see" the moon, the LUX detector should be able to "see" a roughly stadium-sized feature on the moon. 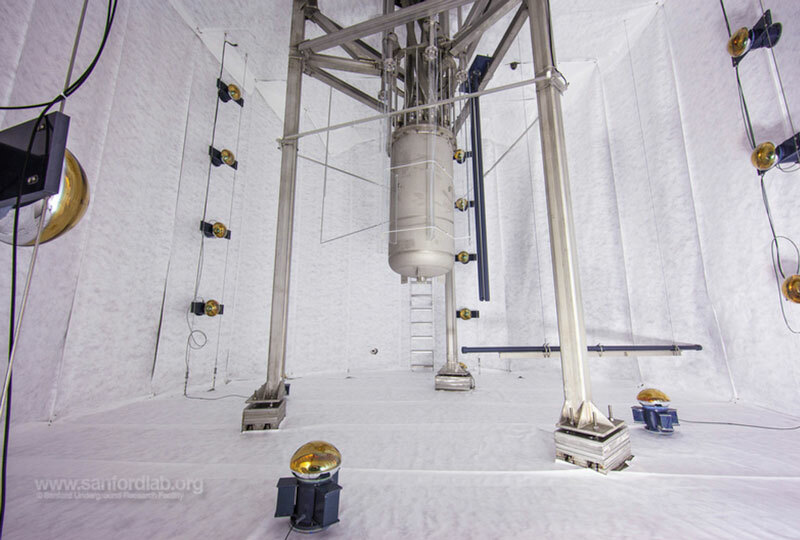 LUX has been running since 2012, and hasn't detected any dark matter particles yet. While this may seem discouraging, it has helped put an upper limit on the interactive strength of dark matter particles, and has therefore ruled out many possible explanations and narrowed the number of candidate dark matter theories. With no positive results in sight, scientists from the U.S. and U.K. are now building a 10-ton detector, which will increase the sensitivity another thirtyfold. The next generation detector, named LUX-Zeplin, is expected to be completed around 2020. Meanwhile, on the other side of the planet, scientists in Australia are building their own underground laboratory to search for elusive particles. All the way across the Pacific Ocean, in the middle of the Australian Outback, scientists are also going underground. The Stawell Underground Physics Laboratory, or SUPL, in Victoria, Australia, is also located inside a former gold mine. Still under construction, the laboratory will be the very first dark matter detector in the southern hemisphere. Unlike LUX, which uses 1/3-ton of liquid xenon, SUPL will use something different to make up its detector. At the heart of SUPL will sit a single crystal of sodium iodide that weighs 110 pounds. SUPL will also employ a special technique called active background rejection to enhance the detector's sensitivity. The crystalline detector will still be susceptible to minute background changes such as seasonal humidity and other local effects, so in order to determine whether a signal is actually from dark matter, and not from, let’s say, a kangaroo's bounce, scientists are building an identical second detector as a fail-safe, and have put it far, far away from SUPL. The two detectors won't detect the same exact particle, but if they have roughly the same sensitivity, they should detect them at the same rate. The chosen site for the other crystalline detector will be inside the largest underground laboratory in the world. The Laboratori Nazionali del Gran Sasso, built in Italy in 1989, is conveniently located inside the Gran Sasso Tunnel that links Rome and the Adriatic Sea, and it uses the massive Gran Sasso mountain as its shield from the "noisy" cosmic rays. The laboratory’s massive mountain shield is useful not only for dark matter searches, but also for detecting a tiny fundamental particle so elusive it has been nicknamed the ghost particle. 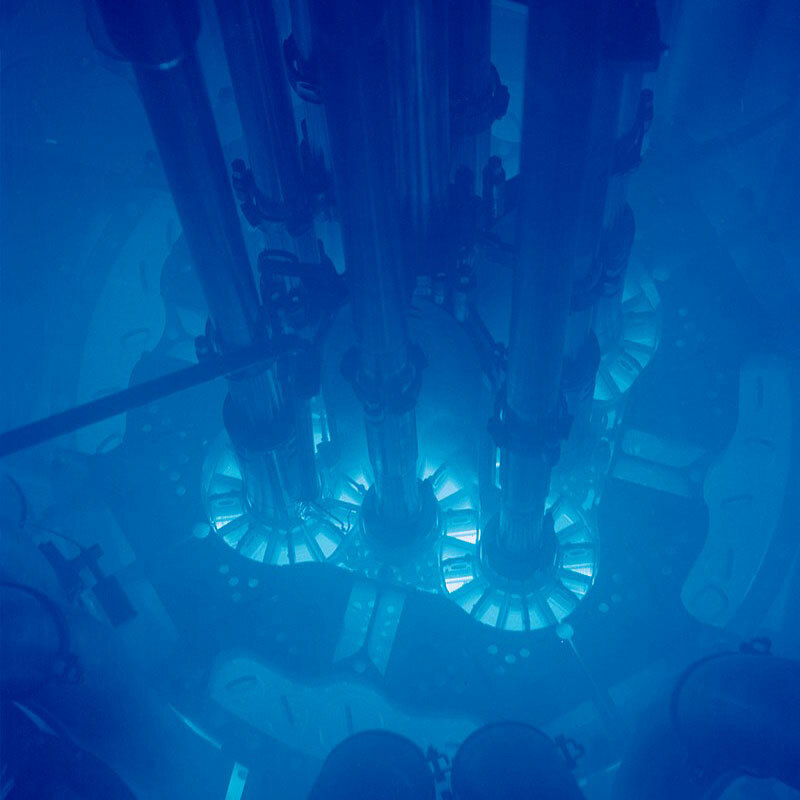 The distinctive blue hue from Cherenkov radiation produced by a nuclear reactor's core. While nothing can outrun light in the vacuum of space, certain particles can edge out light in a short race inside water. Because light only travels at roughly 75% of its "top speed" inside water, it is possible for highly energetic particles to outrun light waves. In the case of a charged particle such as an electron, this results in a distinctive blue flash analogous to the sonic boom generated by a fighter jet when it exceeds the speed of sound. This distinctive blue flash is known as Cherenkov radiation. The existence of these tiny particles, called neutrinos, was first predicted by Wolfgang Pauli in 1931, and experimentally confirmed by Clyde Cowan and Frederick Reines in 1956. The study of neutrinos has since generated eight Nobel laureates, and opened up a relatively unexplored avenue to look at our universe. Astronomical objects like stars and supernovae produce neutrinos, and because neutrinos are completely chargeless and almost massless they can go through things that are impassable to light. This peculiar feature of neutrinos allows us to study parts of the universe that are otherwise invisible to us, and to observe cosmological phenomena that don't send any photons our way. In the time it took you to read this sentence, more than a hundred billion neutrinos have flown through your retina without you noticing. In fact, a typical neutrino can go through a lead slab a thousand light-years thick without even breaking a sweat. While this impressive capability allows neutrinos to show us parts of the universe opaque to light, it is a double-edged sword. Neutrinos' ability to penetrate virtually anything also makes them extremely difficult to detect. Even though the vast majority of neutrinos can pass through earth as if our planet isn't there, every once in a while an "unlucky" neutrino crashes into an electron and sets off a stream of offspring particles. If the crash happens in a material where the particles can travel faster than the speed of light in that material, they emit a streak of blue light known as Cherenkov radiation. But in order to detect this rare and random event, scientists and engineers need a material that is both packed with electrons as well as transparent to light so that the Cherenkov radiation can be observed. So, what is both dense, transparent, and available in large quantity on our planet? Water. 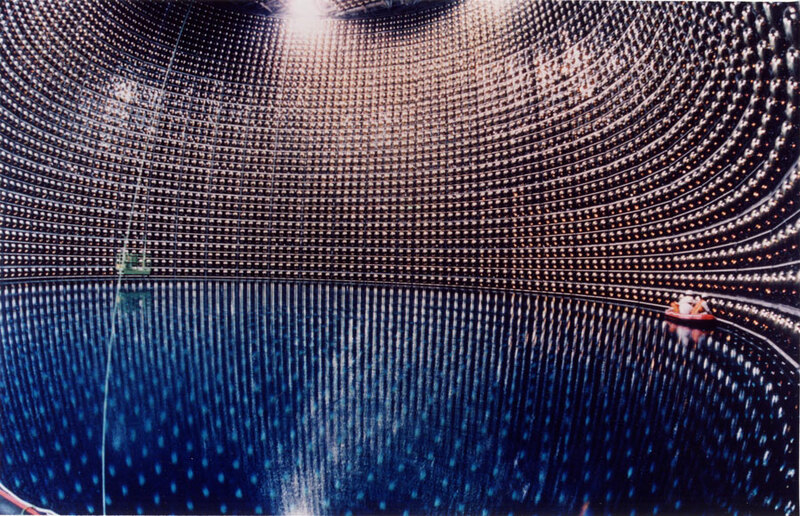 Scientists and engineers have built dozens of neutrino detectors, including spectacular ones such as the Super Kamiokande in Japan. A lot of these detectors are just giant tanks filled with purified water and lined with sensitive photomultiplier tubes -- which are basically just fancy cameras designed to capture the elusive blue flash produced by Cherenkov radiation. Both the Sanford Underground Research Facility that houses LUX and the Laboratori Nazionali del Gran Sasso in Italy also host current neutrino experiments. Two scientists on a rubber dinghy inspecting the photomultiplier tubes inside the water tank of Super Kamiokande, located under Mount Ikeno in Japan. Perhaps inspired by the laboratory underneath Gran Sasso, South American scientists are now trying to build an underground laboratory underneath their own mountains -- the Andes. In 2015, the Argentine government approved the construction of the Agua Negra Tunnel. It will bore through the Andes at the Agua Negra Pass, connecting Argentina and Chile, and is intended to promote the two nations' trade relationship and provide an alternative travel route from Argentina to the Pacific. The proposed laboratory that will sit in this tunnel is named the Agua Negra Deep Experiment Site, with an aptly constructed acronym of ANDES, and is now undergoing the initial design phase. 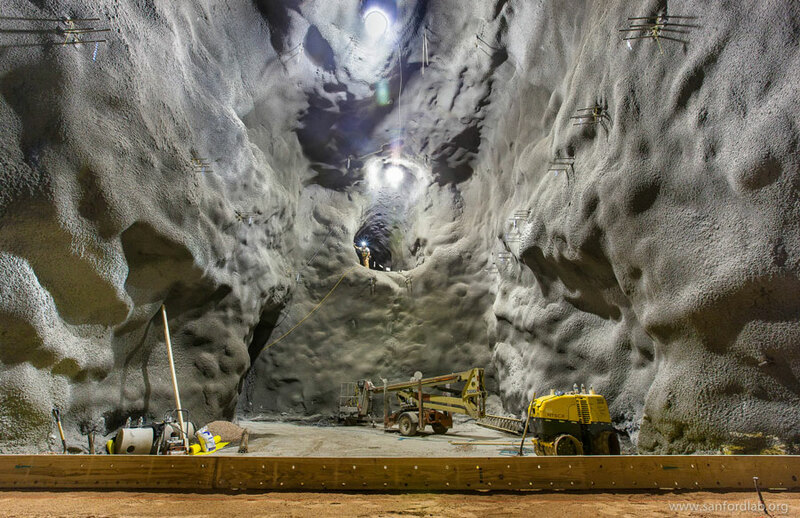 If built, it will be the first underground lab of its kind in South America. ANDES would look for dark matter and would also serve as one of the very few neutrino observatories in the southern hemisphere. ANDES will allow scientists from both side of the globe to compare their neutrino results, according to Xavier Bertou, one of the scientists leading the ANDES project. He is currently an astrophysicist at the Bariloche Atomic Centre in Argentina. Scientists can then use that information to understand Earth’s interior, as well as the way neutrinos interact with our planet. The location of ANDES will also provide a unique opportunity for scientists to study man-made neutrinos produced by particle accelerators -- all of which are located in the Northern Hemisphere -- as the neutrinos pass through the Earth's core. “Also, from a community point of view, it’ll also be much easier for us in South America to have a lab close by,” Bertou said. The laboratory can help inspire the next generation of South American scientists, he said. 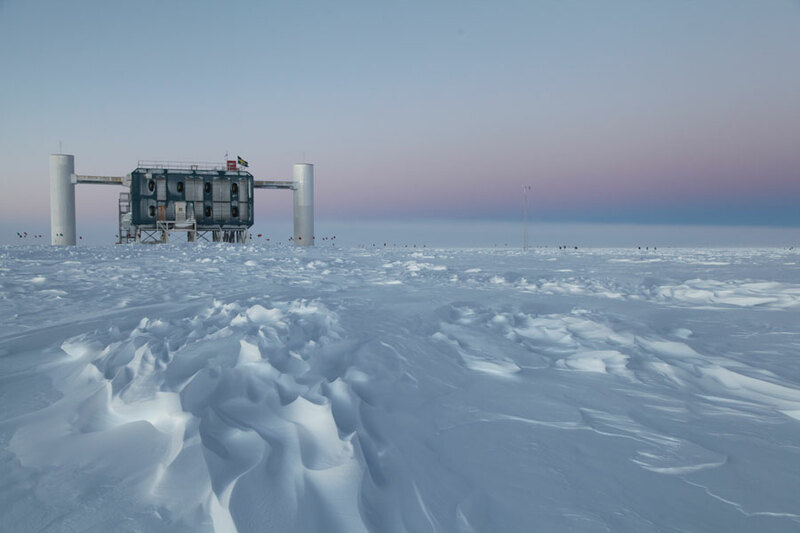 There is another, currently operating, neutrino observatory in the Southern Hemisphere, although it is perhaps even less accessible for Bertou and his colleagues than the ones located anywhere else in the world. That’s because it’s buried in the ice in Antarctica. Depending on your definition of a telescope, IceCube could be the largest telescope in the world. With a volume of one cubic kilometer, IceCube contains more ice than 500,000 frozen Olympic-size swimming pools. Its main purpose? To detect neutrinos. Buried almost a mile underneath the surface of the South Pole, IceCube uses almost one mile of ice as its shield, and then another cubic kilometer of ice underneath as a substitute for the purified water used in other underground neutrino experiments. For the detectors to work, the ice needs to be clear enough that the blue light from Cherenkov radiation can make it to one of the 5,000 buried photomultiplier tubes. And it turns out the South Pole is a great place for transparent ice. According to Francis Halzen, who is a professor of astrophysics at the University of Wisconsin-Madison and one of the leading scientists at IceCube, even the scientists were surprised by the clarity of the Antarctic ice. To give an idea of the ice's clearness, Halzen uses a metric known as the absorption length, which is the distance a beam of light can travel inside a material before losing about 63 percent of its initial intensity. "The relevant absorption length for blue light in tap water is 2 meters; if you distill it, then it's 8 meters," said Halzen. "The worst ice in IceCube has an absorption length of 100 meters." Fully running since 2010, IceCube has detected roughly one neutrino every month, including one named Big Bird, which carried a neutrino record of 1,000 trillion times the energy of a regular photon in the visible spectrum. Scientists think that Big Bird could have been produced by an ancient, super powerful galactic center called a "blazar" from 9.5 billion light-years away. Besides Big Bird, the collaboration has also named their other discoveries Mr. Snuffleupagus, Bert and Ernie, as well as one character from a non-Sesame Street address -- Miss Piggy. Right now, scientists are building another detector, similar to IceCube, but in the middle of the Mediterranean Sea. Instead of drilling into ice, the new cubic kilometer neutrino telescope will sit on the seafloor, and aim to compliment IceCube in the collective hunt for high energy neutrinos. Placing detectors at the bottom of ocean will present a different set of challenge for the engineers. Halzen said the hazards of the deep ocean, including currents, could be even more difficult to overcome than the natural challenges in Antarctica. "Melting the detectors into the ice was easier than to put them in deep ocean waters and then face the elements I think," he said. "Even if you have to go to the South Pole to get it done."